Infiniti JX Concept: Deja a second "teaser"
The Infiniti brand is poised to become the specialist of the Target and dark image, commonly referred to "teaser". This time, it makes us discover a tiny portion of the forms that take the future Infiniti JX Concept. Thus, in less than a month, we have the right to a third photo of a section of said vehicle in development. It is a new model that will accommodate up to seven passengers and, in very convenient way. We're talking about a vehicle that would be positioned between the FX and QX models. 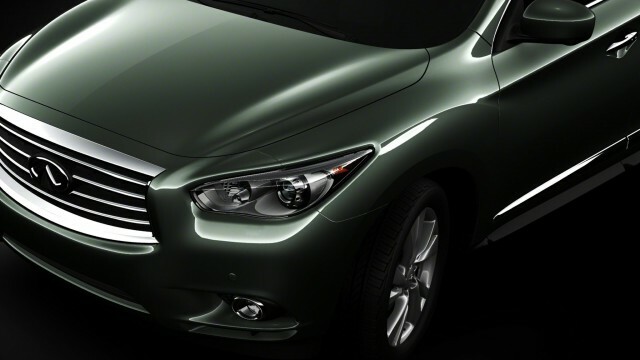 Moreover, if we trust in this third image that is presented to us and showing us a part of the rear section, it appears that we are in the presence of a vehicle whose flag will inherit a substantial part lines Infiniti Etherea concept. A crossover vehicle type with tapered lines whose main task will be to enter into direct competition with the BMW X6 whose popularity enrages all manufacturers. What brings all or almost want to offer a 2012 or 2013 a rival it. The famous Concours d'Elegance at Pebble Beach which is associated with the Infiniti brand for several years, will host the first public release in front of the Infiniti JX Concept. This event is scheduled for August 18. Deja, a campaign was launched on Facebook has www.facebook.com / infiniti design has to prepare the coming of this new vehicle address. The final model, called the series, we will be unveiled in mid-November at the Motor Show in Los Angeles, while marketing is planned for the spring of 2012 as a model 2013. And large cell speeding, new measures!